All pictures in this section courtesy of Phin Sloan. The UDV was moved into the shed, in the beginning of September 2017 to allow some heavy work to be done on the coupling rods. The coupling rods join the wheels together so they all rotate at the same speed. 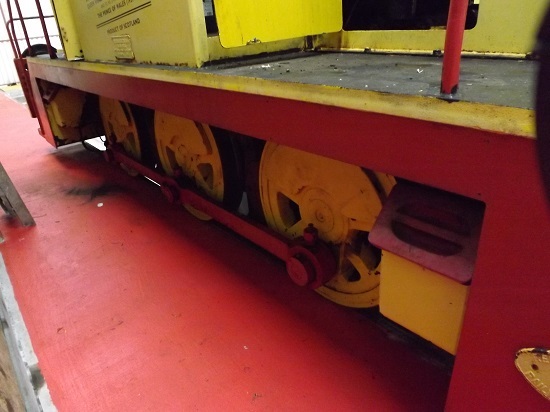 The coupling rods required new bearings fitted where they couple to the wheels. Left photo shows the side of the UDV being worked on with the coupling rod removed. Right photo is a closer view of the wheels minus coupling rod. The pins jutting out from the wheels are where the coupling rod joins to the wheels. The bearings within the coupling rod were badly worn. The coupling rod was sent offsite to have the worn bearings replaced. When it is returned it will be fitted and attention will then turn to the other side of the UDV. This photo shows the other side of the UDV with the coupling rod still in place, this rod will not be removed until the coupling rod on the other side has been replaced. Work is being done on one side of the UDV at a time to ensure that the wheels remain in the correct position.